KIRKLAND, Wash., April 9, 2019 – Kenworth has published the new 2019 Kenworth T880 Brochure with the latest, comprehensive information on the company’s popular vocational leader. The Kenworth T880 provides a durable, reliable and productive truck for vocational fleets and truck operators in bulk haul, mixer, dump, heavy haul, oilfield, logging and refuse applications. The Kenworth T880 is available in day cab, 40-inch flat top sleeper, 52-inch and 76-inch mid-roof sleeper, T880S set-forward front axle, and new T880S twin steer configurations. The 36-page Kenworth T880 brochure features the PACCAR MX-13 engine and the PACCAR MX-11 engine. The T880 is standard with the PACCAR MX-13 engine rated up to 510 hp and 1,850 lb-ft of torque. The 12.9-liter engine provides a lightweight, fuel-efficient engine for vocational applications, including dumps and heavy haul applications over 100,000 pounds. The PACCAR MX-11 engine produces up to 430 hp and 1,650 lb-ft of torque, and is especially for vocational and regional haul customers operating in weight-sensitive applications. The PACCAR MX-11 engine is 400 pounds lighter than 13-liter engines and nearly 100 pounds lighter than other 11-liter engines for enhanced fuel economy and payload capacity. The engine also offers optimum performance, industry-leading reliability and durability, and a quiet operating environment for drivers. Kenworth vocational trucks, such as the T880, have long been the chassis of choice for many vocational body builders and operators. Whether running dump trucks, wreckers, mixers or other applications, they require a chassis that can be easily integrated with a range of bodies and PTO functions to meet their requirements. The brochure offers a four-page section on the T880’s new body integration technology and multiplexed electronic system, which is the foundation for a range of body integration technologies. These include new PTO functionality optimized for PACCAR MX engines; multiplexed switches for improved diagnostics and wiring simplification on the chassis and dash; industry standard CAN interface for body controls, telematics and ELDs; and enhanced data security that decreases the likelihood of dash lamp activation due to aftermarket device additions. 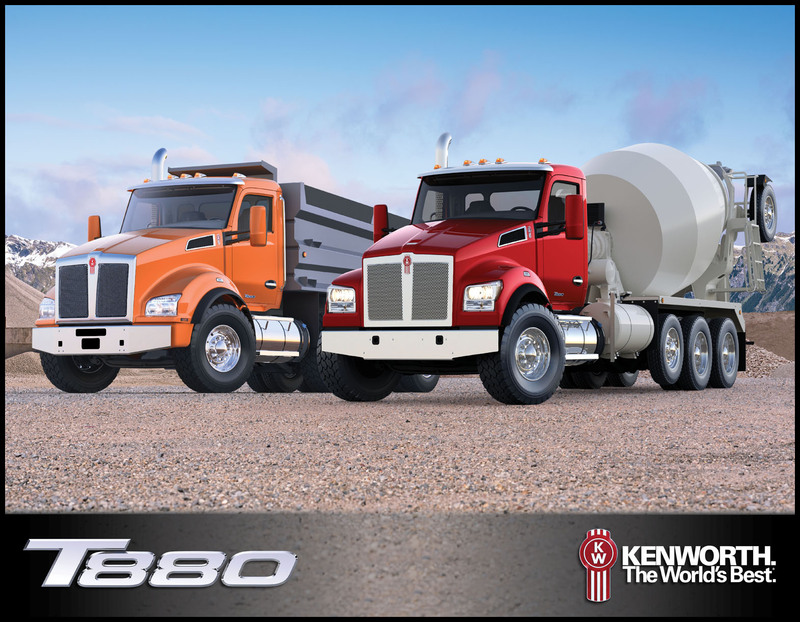 The T880 brochure features Kenworth TruckTech®+ Remote Diagnostics and Service Management, Kenworth Driver Performance Center, Kenworth Nav+ HD system, interior colors and options, and Kenworth seats with superior comfort, adjustability, ride suspension and personal climate control. Detailed specifications are shown for engine/powertrain, exhaust/aftertreament system, transmission, electrical, starting and charging, frame, axles and suspension, brakes, wheels/tires, fuel tanks, battery boxes, bumpers, cab/hood/interior, driver assistance technology, and special equipment and options. Download the new Kenworth T880 brochure from the Kenworth website: www.kenworth.com/media/55722/t880-brochure-01-29-2019.pdf and the 2019 Heavy Duty Body Builder Manual: www.kenworth.com/media/55366/hd-t680-t880-bbm_update_102618.pdf, or contact your local Kenworth dealer.